Gallery | We save all of your photos to your native camera roll. This makes managing your photos and videos easier. Some apps build their own libraries on your phone, but we found that to be a frustrating user experience. In the library you can see your images where you can delete, share, favorite, and click to edit in Darkroom. Settings | Everything you need to manage your purchase, get help, and control advanced photo and video settings. Location tracking is off by default, but you can turn this on if you want metadata attached to your photos. Shutter | This is our main shutter to shoot photos, a burst, or record videos. You can also use the volume up button to snap a photo or the physical button on our Battery Photo Case. This is no ordinary shutter button and we'll dive into that in Tip #2. Front Camera | Switches between the front camera and back camera(s). It works like the toggle in the standard iPhone Camera app so no surprises here. Capture Mode | Toggle photo or video capture modes. The camera icon means you are taking a photo. The video icon means you are shooting a video. You'll notice the shutter button also changes in these two modes so you know what mode you are in. Dual Lens Selection | If you have a dual lens phone then in the lower right corner of the screen you will see a selector to pick which lens you shoot with. This is the most helpful if you are using a Moment Lens so the phone doesn't switch on your behalf and provide a black screen. Grid Lines | Toggle to select any of our virtual grid lines. These help you to align the shot and don't impact the size of the photo saved to your camera library. Default is no grid lines, otherwise you can select 1:1 square, Rule of Thirds, and the Golden Rule. Flash | Allows you to toggle the flash between on, off, and auto. Timer | Toggle to select a zero, three second, or ten second timer for your shots. Burst | Switch between single photo or burst mode. We get more into burst mode in some upcoming tips. File Type | Toggle between JPG, TIFF, and RAW. We dive into what these mean and when to use them in future emails. Simplest way to think about them is JPG are smaller files, followed by TIFF, then RAW. 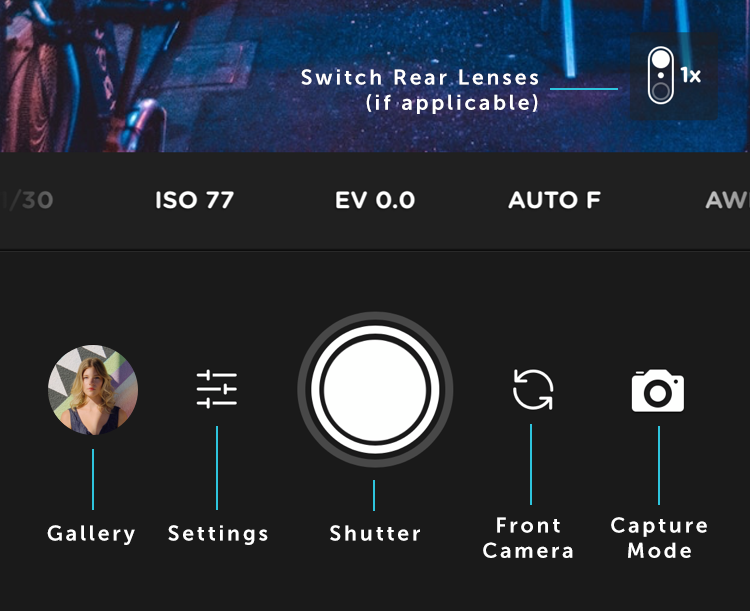 Lens | Select which Moment Lens you are shooting with. We add that information to the metadata on your photo.